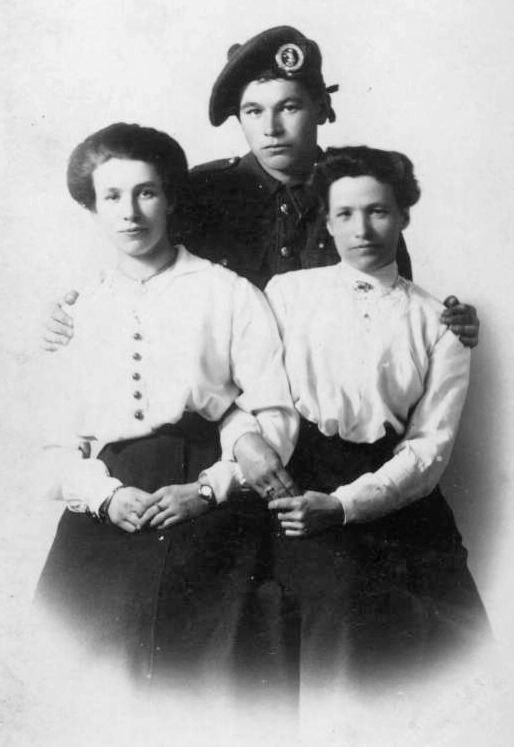 Sepia studio photograph of Annie Mackay, John Mackay and Nellie Mackay. Taken in 1917 with John Mackay (1897-1969) in uniform. He also served in the 5th Battalion Seaforth Highlanders from 1917 -1919. Resided in 7 Carniag Street, Dornoch and was employed by the Highland Railway Company. Served in France with the British Expeditionary Force (BEF). Extra information on handwritten sheet plus two photocopies of envelopes addressed to John Mackay in France "203641 Pte John Mackay, 14 Platoon, D Coy, 1/5 Seaforth Highlanders, BEF France" Display board photocophy catalogued as 2003.242.002 John Mackay dates of birth 03/05/1897 to 28/06/1969. Date of photograph is January 1917. Employed by Highland Railway Company before and after military service. Copy of original photo.